On Italo Deli’s website, they call themselves ‘THE BEST SHOP IN LONDON’. While this may be a bit ambitious, they are definitely the nicest place I’ve found in Vauxhall. This corner of South London is generally not the loveliest of areas (if you want fifty shades of grey, as in literally fifty different shades of corporate grey, come to Vauxhall), but slip down a few side streets to Bonnington Square and you can almost forget where you are. Bonnington Square is a former squatters paradise and has retained a slightly hippy, bohemian feeling, despite the office blocks just a few yards down the road. The streets are pretty and lined with trees and bicycles, and the gardens in the centre of the square are the perfect lunchtime escape for stressed out city workers. There are adult size swings (!!) and grassy knolls on which to sit and read books undisturbed. 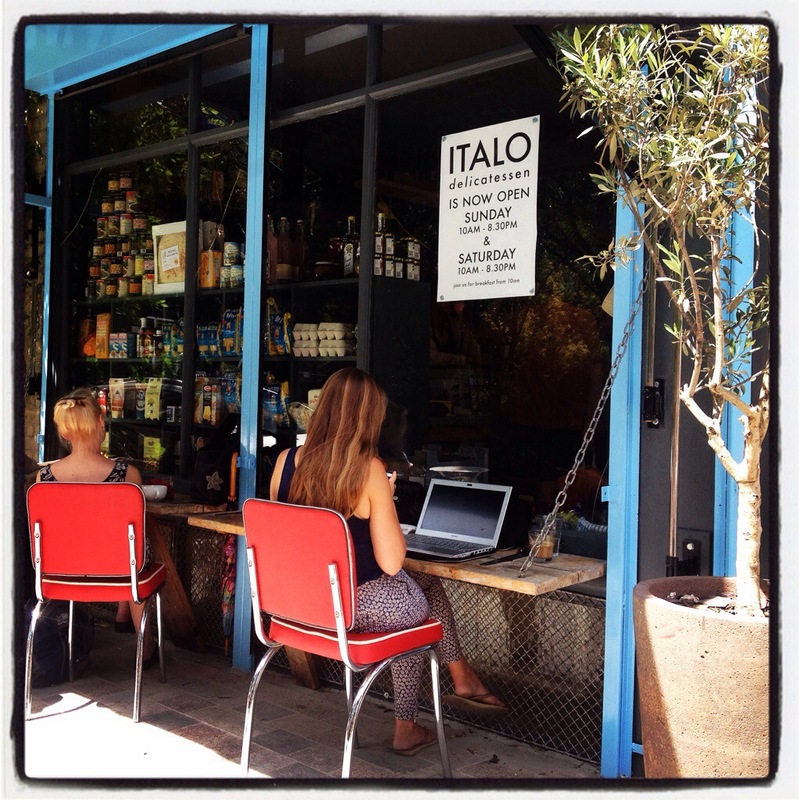 Italo deli is a tiny food-lovers oasis in the middle of all this. 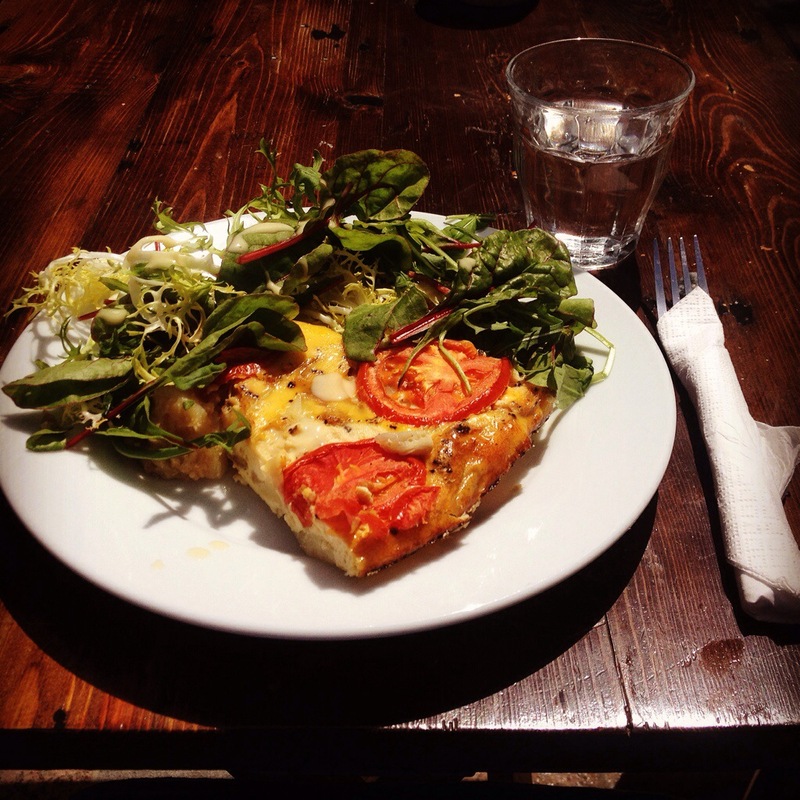 This is a potato, onion and tomato frittata. They sell some delicious, posh deli sort of fare: smoked meats, organic fruit and veg, luxury juices and chocolate…all the things I would buy all the time if I had a bit more £. During lunch they serve up a choice of freshly-cooked meals and sandwiches. I recently ate the most amazing potato gratin of my life here. Although Italo Deli do not advertise their food as gluten free, I have almost always been able to find one thing on the menu that is GF. It is relatively easy to talk to the chef as the kitchen is just behind the till, and the staff are amenable to helping out a coeliac. They are also the only high street shop I’ve found that stocks the lovely gluten free La Buona Vita Pasta (one of my Top 5 GF pastas). If Italo is full, step across the street and have a look in The Bonnington Cafe. It is a sweet community-run cafe, serving up vegetarian food (and vegan on thursdays) cooked by different local chefs each day. It is pot luck as to what you will get, and the menu and food quality are entirely dependent on the chef and food available on the day. Gluten-wise, I have usually been okay eating there as they typically serve a lot of dhals, rice, salads, soups, but it is always best to check. Although I wouldn’t necessarily advocate making a special trip to Vaux-land due to the changeable menus of these places, I would absolutely recommend popping your head around the door if you’re in the area. Follow Italo Deli on Twitter for daily menu announcements, or check out their website here. Read a bit more info about their origins (and celebrity links) here. Previous PostI’ve been nominated for a Liebster Award! Next PostBreakfast hero products : Gluten, wheat and oat free!